We are a full-service environmental, engineering, and construction firm in the water resources, hydropower, fisheries (passage and aquaculture), dams, markets. We are able to contribute to a project at the planning stage, navigate the regulatory requirements, develop a design, and self-perform construction, start-up, and commissioning. Our technical skills include environmental studies and permits; civil, structural, mechanical, electrical, and geotechnical engineering; hydraulics and hydrology; CFD modeling; and tunnel and underground project engineering. We also have leading professionals in fisheries, hydropower; permitting and regulatory assistance; dams; spillway, intake, and water conveyance design and rehabilitation; irrigation system design and pipeline projects. Our Fisheries Division has performed a wide variety of projects that cover instream habitat improvements; upstream fish passage (traditional fishways and rock weirs); downstream fish passage; juvenile collection and evaluation facilities; anadromous acclimation facilities; adult collection and sorting facilities; fish hatchery renovations; and full hatchery designs for both anadromous and resident salmonid species throughout the United States and Canada. Services range from site evaluation and selection, feasibility analysis, concept and final design, and construction support. We also completed several projects from planning through construction utilizing our design-build model. We were awarded a feasibility analysis of the 100-year-old Fort Qu’Appelle Hatchery in the Saskatchewan Province to improve water quality and production facilities to accommodate up to 30 million Walleye fry, and a combination of one million Brook Trout, Rainbow Trout, Splake, Lake Trout, Brown Trout, and occasionally Pike. 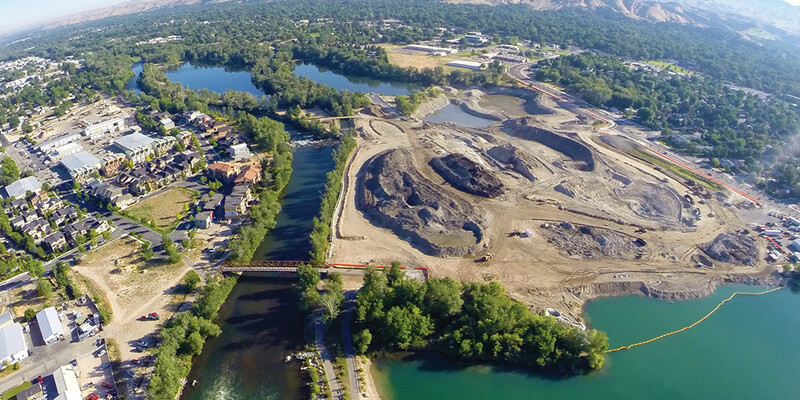 Through an IDIQ with the U.S. Army Corps of Engineers (USACE), we received a contract to assist with the feasibility study for the permanent fish passage solution at the Albeni Falls Dam. McMillen Jacobs provided the necessary feasibility-level engineering, design, and cost estimate of the Tentatively Selected Plan for upstream bull trout passage. Our most notable accomplishment was the completion of the Idaho Fish and Game Springfield Hatchery in support of the endangered Salmon River Sockeye. Services included bio-programming, conceptual design, construction and operating costs, HGMPs, groundwater investigations, topographic surveys, and scientific justification for a program that had previously not been able to obtain Independent Scientific Review Panel (ISRP) support. McMillen Jacobs’ design-build contract included all work for the pre-planning, engineering design, and full construction of the Springfield Hatchery and surrounding support facilities. The hatchery released its first smolts last year, and we are excited to see the returns from the release back to the interior of Idaho at Red Fish Lake. We have conducted habitat studies, taxonomic analysis, and ecological studies of threatened, endangered, and sensitive fish species and stocks, including bull trout, cutthroat trout, rainbow redband trout, chinook salmon, coho salmon, sockeye salmon, chum salmon, and steelhead trout. We’re also experienced in developing and executing adult trapping and design, as well as construction of holding and spawning facilities and complete aquaculture production facilities. We maintain in-house capabilities in water treatment, specializing in filtration, degassing, oxygenation, ozone, and UV treatment. We’ve spent decades mastering the complicated challenges of creating fish passage facilities, from small-fish passage projects on low-head diversion structures to large passage projects at major hydroelectric facilities. In fact, our team has hands-on experience with many types of passage requirements at more than 50 hydroelectric facilities and dams throughout the West. Our in-house experts — including biologists, fisheries engineers, and hydraulic engineers — support our construction team members as they develop their understanding of river systems and target species. Fish passage and collection facilities often face unique structural challenges thanks to their placement on existing structures and the way they convey water. Our experience includes both permanent and temporary upstream passage facilities. For temporary facilities, we develop projects that utilize modular components that can be installed and removed annually, as well as floating systems that can be stored in a safe location on the river during the off-season or removed and stored. We work closely with our clients and their stakeholders to develop the initial engineering, biological, and operation design criteria; collect the required engineering and biological field data to confirm the design approach and configuration, and develop the final design plans and specifications required for construction. We have completed many in-river projects that have required modular barges to support our cranes and materials, and we’re adept at determining the best flotation system and configurations for accommodating equipment. We’ve also served on design teams that have developed floating surface collectors (FSC), floating upstream traps, and modular fish traps that are designed to be installed and removed annually. Our experience includes all facets of structural design of major hydroelectric facilities, including spillways, stilling basins, and outlet valves and gates. We have worked on both low head and high head facilities, conducting evaluations of existing systems to resolve operation problems, developing design alternatives, and preparing plans and specifications for new facilities, and self-performing construction services on these facilities. We design and analyze reservoir outlet works, including intake structures, tunnels, conduits, and energy dissipaters. For both new hydroelectric facilities and rehabilitation of existing reservoir outlet works, our staff members apply state-of-the-art finite element modeling tools to analyze complex structures, resulting in the most cost-effective solutions for our clients. We understand the hydraulic design elements of these structures and prepare detailed structural design packages that optimize hydraulic performance.